How many times have we been in a Business-to-Business sales meeting where we did a lot of the talking, explaining to a prospective new customer what we had to offer and how they should engage with us? I’m sure many of us have also experienced the lack of engagement following such a meeting when we actually thought it had gone particularly well. There are lots of reasons of course why any sales engagement may falter but in today’s more competitive B2B world the focus is shifting more and more towards solving business problems which facilitate the customer doing better business. We might feel we have a product with capability that our competitors can’t match or a service that offers greater value but do we take a step back often enough and try to understand what is the real problem the customer is looking to solve ? am I currently offering the right solutions? do some gaps exist in my portfolio of solutions? does the customer need more than I can currently offer? do I have the right people with the skill-sets required to deliver? do I have the right tools, work practices, processes? is my marketing message clear so customers can understand it? is it easy for my customers to find me? do I know the real value I can bring to a customer’s business? can I actually quantify this value – put a euro value on it? do I really understand my customer’s business well enough? can I pinpoint my customers business issues or “pain points”? do I understand the business impact these “pain points” have? am I pushing my products instead of trying to propose solutions? There is one very obvious analogy here. If you visit the doctor with an ailment does the doctor immediately prescribe some medicine? No, it is more likely that the doctor will firstly try to understand more about your symptoms, your history, your recent activity etc and only after a period of consultation and dialogue will the topic of medicine or any other form of corrective action arise. Servitization is an industry term which is becoming more commonly used to describe the evolution of a product-based business into a solutions-based business through the addition of services. The key to a successful Servitization is in understanding the customer’s business beyond their use of YOUR product and then putting in place a better set of solutions which are solving the real customer business issues. 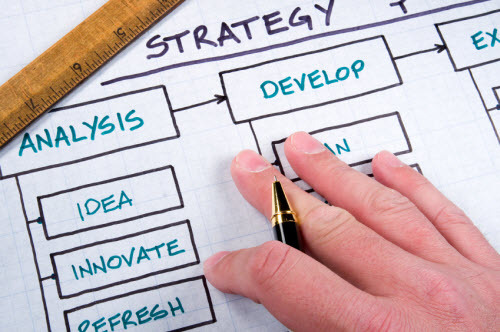 If you can get a better understanding of where your product fits, who uses it, what do they use it for, which other products are linked to it or used in conjunction with it, then you are starting to understand a lot more about your customer’s business and more importantly the business issues which they are facing on a daily basis. It is possible that the customer never thought of asking your help with one of these business issues because they just assumed your focus was limited to your own product line(s). Perhaps you could actually help them in many more ways than you realise – AND grow your revenues at the same time ! The diagram below is a simple illustration of a product positioned into a customer organisation. YOUR product may sit alongside other different products from a variety of suppliers but how many of these product suppliers are solving additional business problems for the customer? 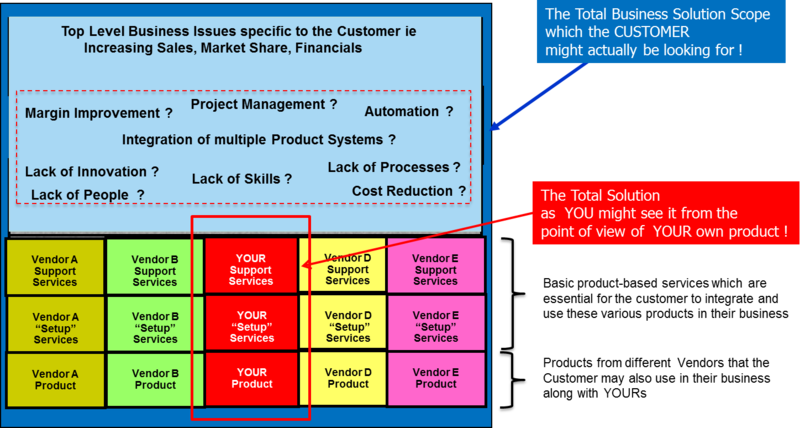 Even if we don’t want to deliver these additional services ourselves we can bring in a partner but the important thing is we are starting to look beyond our own product – which we might only sell once to any given customer – and into the area of solution-based services which we might incrementally sell year on year if the solution is right and we are addressing real business issues for the customer. Adopt a Solution-led approach with your customers – understand their real business “pain points” and see where additional services and solutions beyond your product could make the difference. This entry was posted in Business Advice, Business Support and tagged Beacon Initiative, John Flynn by padraigbeaconinitiative. Bookmark the permalink.